(Telegraph) China earthquake: Teacher admits leaving pupils behind as he fled Chinese earthquake. Richard Spencer. June 12, 2008. In an act of moral foolhardiness, Fan Meizhong set out on a blog his guiding principle: in matters of life and death, it's every man for himself. When the quake struck, rather than overseeing an orderly evacuation, he said he just shouted "Stay calm, it's an earthquake!" and ran for it without looking back to see if his pupils were following. "I ran towards the stairs so fast that I stumbled and fell as I went. When I reached the centre of the football pitch, I found I was the first to escape. None of my pupils was with me," wrote the man now known across China as 'Runner Fan'. When his pupils began to arrive, they asked: "Teacher, why didn't you bring us out?" His explanation was simple. "I have a very strong sense of self-preservation," he said. "I have never been a brave man and I'm only really concerned about myself." While newspapers have largely followed instructions to concentrate on uplifting tales of rescue work since the earthquake, the internet has seen a wild variety of tales emerge. It was internet sites that first reported the quake, and where some of the first pictures of collapsed schools were posted. Internet users have debated how to apportion blame for shoddy building work, as well as rallying praise for emergency services and politicians seen to have done a good job. Other local officials have been vilified by name for a variety of offences, some relatively trivial, such as smiling too much during visits by their superiors. Some plotlines have been wild, such as those which have discussed whether fortune-tellers could have foretold disaster, but few have hit upon such a sensitive topic as Mr Fan. He was not the first to raise the issue. Many news reports have focused on stories of teachers putting children first, almost certainly representing the vast majority, such as that of another teacher, Tan Qianqiu, whose body was found shielding four of his pupils, all of them alive. But some schools were uneasy that their teachers had a higher survival rate than pupils. One such was Juyuan School, where hundreds of pupils died - parents say 500 to 700 though the official number is 278 out of 900 - but only six out of 80 teachers. Parents pointed out that teachers stood nearest the doors. But Mr Fan went further, attempting to justify his abandonment of his pupils, who all survived the quake. "I didn't cause the earthquake, so I have no reason to feel guilty," he said in an interview. "When I got back to the classroom, the students were all fine." He also risked angering those closer to him, saying he would not have tried to save his own mother if she had been present, though he might have made an exception to his general rule for his one-year-old daughter. He pointed out that education law does not demand that a teacher save his pupils during an earthquake. "If every teacher was like Mr Tan, then we'd have no more heroes," he said. "I admire heroes like Mr. Tan, but I can't do that myself. I love my life more." Now the head of the private school where Mr Fan worked is under pressure to fire the teacher, and publicly questioned Mr Fan's wisdom in being so frank. Running might be a normal reaction, he said, but talking about it afterwards was something else entirely. One commentator in a state newspaper, the Shanghai Daily, described Mr Fan as a "courageous coward" for admitting what happened - but added that his courage was not sufficient to exonerate his cowardice. Mr Fan may as he said have been trying to prick the hypocrisy of "insincere tears", the commentator said. "Yes, there are insincere tears but you, Fan Meizhong, should have challenged hypocrisy with sincere tears," he wrote. (The Guardian) Is this really China's biggest coward? Jon Henley. June 4, 2008. When last month's Sichuan earthquake struck, Fan Meizhong was teaching a literature class at Guangya high school in the town of Dujiangyan. "It's an earthquake," he shouted, before legging it out of the door, down the stairs and on to the playing field. On reaching the middle of the football pitch, Fan later confided to his blog, "I found none of my pupils were with me." And when, back in the classroom, those pupils - none of whom, thankfully, was harmed - asked why he had not tried to help them escape, he replied: "I have never been a brave man, and I'm only really concerned about myself." Fan's refreshing frankness has sparked outrage in China, with bloggers dubbing him "Runner Fan" and demanding his dismissal. "But the fact is," the teacher told the Changjian Times, "at the instant of an earthquake, a teacher is weak, too. Neither the state nor the school taught me life-saving or rescue techniques. I was scared, and my instinctive response was to run." Ismay, "the greatest coward in history", who as managing director of the White Star line abandoned the sinking Titanic as 1,500 of his passengers perished, never attempted such a bold justification of his actions. Cowardice is, in any case, a moral maze: how much courage did it take to be a conscientious objector? Fiction, though, loves cowards: think Don Quixote; think Flashman; think Shaggy from Scooby Doo. Hemingway (he would) reckoned cowardice was merely "an inability to suspend the functioning of the imagination". But if, as Mark Twain said, "the human race is a race of cowards", you have to be a pretty brave one to actually admit it. (yWeekend) Partial transcript provided by Phoenix TV. June 8, 2008. 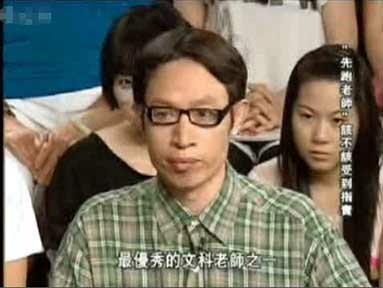 Recently, the “runaway” teacher Fan Meizhong was a guest on the Phoenix TV program <A Chat Session with Hu Yifu>. The program host Hu Yifu divided people into two sides: those who support and those who oppose Fan Meizhong. During the debate, Fan Meizhong said that he needs to apologize to his students. But he also emphasized that he will not apologize for what he wrote on his blog. In the course of the program, the guests clashed mightily. 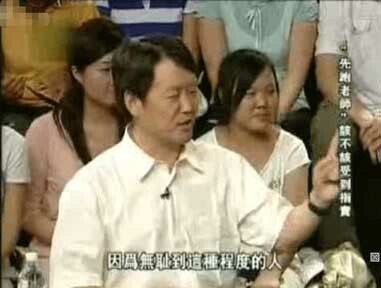 The guest Guo Songmin who opposed Fan Meizhong walked out of the studio set in a huff at one point. But ultimately, the two shook hands at the end of the show in a spirit of mutual tolerance. Fan Meizong is a teacher at the Guangya School, Dujiangyan. He had graduated from the Department of History of Peking University in 1998. In the eyes of his friends, he is a fanatic for education, especially in carrying out the knowledge that he learned from studying education. In the eyes of the students at the school, he had better vision that all the other teachers. In the eyes of the school principal, he was a diligent worker who never arrives late or leaves early. So why would such a teacher be the first to dash out and abandon the students when the earthquake hit? Hu Yifu: I don’t know how to describe you. When people ask you about your occupation, how would you reply? Hu Yifu: When you make that reply, do you feel that teacher is a holy occupation? Fan Meizhong: I don’t think that it is holy. Hu Yifu: What kind of work do you think it is? Fan Meizhong: I think that it is just like any other occupation. It is just one of many occupations. I tend to think that a teacher has the job of educing the thinking and intelligence out of people, including letting the students express their creativity. I reject the notion of holiness. Nobody is holy, so no occupation is holy. Hu Yifu: Up to now, do you feel that you are a teacher who performed his job adequately? Fan Meizhong: If I did not perform my job adequately, then there is no hope for education in China. In China today, I consider myself to be one of the best teachers in humanties. Hu Yifu: Since the earthquake, you took on another role. You are also a disaster victim. You published a blog post in which you narrated your most authentic thoughts. For that, you did not get any sympathy from people. You said that you you are not a person who is courageous to give up your life for others. You said that you only care about yourself and you have a strong awareness of crisis. When the earthquake hit, what was the actual situation? Fan Meizhong: At the time, I reacted instinctively. Hu Yifu: So you fled without turning your head back? Hu Yifu: You did not tell the students to rush out? Hu Yifu: Do you regret now at not having yelled out? Fan Meizhong: I think that when the earthquake hit so unexpectedly, the mind goes blank. At the moment, I lost the power to think rationally. From that viewpoint, there is nothing to regret. It was not my responsibility. You cannot say that I intentionally did not yell, or that I did not want to save the students. At that moment, I was really not in control of myself. Hu Yifu: We have now heard the authentic version. Can you accept that Fan Meizhong's assertion that he a teacher who performed adequately? Guo Songmin: If his performance was adequate, then even a rabbit can be a teacher. When a rabbit encounters danger, it will only think about running away and nothing else. Fan Meizhong: I am very happy that there is such a morally high-minded person in China such as yourself. Guo Songmin: This is not about moral high-mindedness. This is about the bottom line. First, you abandoned the duty as a teacher and you fled first. Secondly, you did not even given a yell to the students. Thirdly, you are an adult. If what you say is right, then the soldiers at the front line can put down their weapons, pilots can parachute out first before their passengers and the captain can abandon his ship and flee. Our entire society would lapse into chaos. Fan Meizhou: I am very happy that there is such a morally high-minded person in China such as yourself. Why did I say that? Because after saying this, I think China’s problems about environmental protection, education and all that will be easily solved. You mentioned professional ethics for teachers before. I don’t think that it is up to you to define professional ethics. Guo Songmin: But should you be the one to define it? Professional ethics is something that is commonly accepted. At this time, people disagree with your position. This shows that you have violated the commonly accepted notions about professional ethics. Fan Meizhong: Just because you don’t accept it doesn’t means that other people also don’t accept it. Are you the moral arbitrator? Guo SongMin: There are plenty of Internet surveys. 80%, 90%. How many people agree with you? Fan Meizhong: The professional ethics for teachers say that they have the responsibility to protect the students to a certain extent. You mentioned pilots and soldiers. I would like to say that a teacher is not a soldier. So the professional scope of a soldier is not the professional scope of a teacher. Mainly, a teacher is there to transmit knowledge. There is another issue about morality. This is the bottom line morality. Sacrificing your life is not bottom line morality. A sacred morality requires you to be able to apply it to yourself as well. The morality to sacrifice can only be used to condemn yourself and not others. In terms of professional requirements, I don’t think teachers should be required to risk their lives to protect the students due to their professional ethics. When a student falls ill, I will take him to the hospital. That is not a problem. Guo Songmin: This is not about sacrificing your life to save the lives of students. Rather this is about whether you can save your own life at the cost of the lives of students. Everyone who has attended school knows that we cannot leave until the teacher gives the order. The students will sit still in their seats. You sacrifice their lives in order to save your own life. This is not about asking you to give up your life to save theirs. It is the exact opposite. Even so, you have a responsibility because you are a teacher and they are students. You are an adult and they are minors. Fan Meizhong: Wait a minute. My students are second-year high schools who are seventeen or eighteen years old. Guo Songmin: They are still not yet adults in second-year high school. You did not take the time to yell. You told the students not be afraid, then you ran away. You were afraid that the students would block your exit! Fan Meizhong: I did not sacrifice any student lives. Several hundred students, teachers and staff members got out of Guangya School with no injuries. In my class, only two or three female students did not run out. The other students dashed out too. Secondly, my students are not that obedient to me. Let me give an example. I once said told my students, “If you don’t come to class, I can accept it because it shows that my classes have no attraction for you. During my classes, you can go to the restroom anytime without having to ask me for permission. You can leave any time without my permission.” Thirdly, you said that I was afraid that the students would block my exit. You don't know what the Guangya classrooms are like. There are only a dozen or so students in my class, but the classroom is very large. There is no issue about blocking the way. Perhaps people is using the typical school in China to assess this school. Hu Yifu: Now that things have reached this point, many people are wondering just why Teacher Fan wants to speak out so frankly? People say that nobody tells the truth when they are the object of criticisms. Could he have made an apology through a friend? Wu Liming: Each person has his own responsibility. At the key moment, it serves no good for him to die. But this person happens to be more sincere and frank. Is it so wrong to be frank? Hu Yifu: Those teachers who did not speak out could have done exactly the same thing as he did. But people are not condemning those teachers. Instead people are condemning the person who spoke truthfully. Have we been kidnapped by these excessively lofty morality? Wu Liming: Yes, I think that there is some degree of truth to that, but it is not the whole thing. First, the media reporting on this affair was incomplete. Therefore, when the information is tilted towards his being a teacher and quite shameless, people reacted accordingly and transformed their strong sorrow about the earthquake against “Runner Fan.” He is first of all a disaster victim who has survived. He had experienced the terror that was the earthquake. He has to endure this for so long, he has to endure the media from all over the country and he has to endure the torrent of abuse on the Internet. Even a man made of steel and iron cannot endure this. Fan Meizhong: I want to talk about moral hijacking. Many people ask, “Could you accept your child being in his (Fan Meizhong) class?” I want to ask just what kind of public morality is that? This is just the selfish morality of a certain group of people who are looking after their own interests! Their idea is that you should sacrifice your life for their child. But I don’t care about how heart-broken your mother, siblings, wife and children become as long as my child is safe. Afterwards, I will proclaim you to be martyr. Thus, I think that even as society is piling all sorts of responsibilities on teachers, their rights are not receiving the corresponding protection. I have to defend the freedom of speech that I claim. When the mainstream opinions are divided, I am prepared to be condemned by everybody. When the earthquake hit, I fled. I admit that I was not brave. But when I face the condemnations about my moral judgment, I have to borrow the term “thought martyr” that my friend used. Guo Songmin: Let me say a couple of things. You have to right to defend your values, but you cannot stop others from criticizing those values. Fan Zhongmei: You can criticize, but you cannot make personal attacks against me. Guo Songmin: Other people have freedom of speech. Fan Zhongmei: I also have the right to make personal attacks against you. Guo Songmei: But you were attacking yourself! Fan Zhongmei: You are an idiot! Guo Songmei: You were the one who ruined your own life. Did you need me to ruin it? Hu Yifu: Could you please be more courteous? Both of your are intellectuals. There is no need to make accusations back and forth, okay? Wu Liming: I want to say that the students all got out alive. Teacher Fan and the other teachers organized the students in an orderly fashion. He was not a deserter. But he lost his judgment at the instant when the earthquake hit. By the time that he reached downstairs, he came to his senses. He organized the students, right? He recovered. If you don’t believe me, you can call his school principal right now. Hu Yifu: Everybody is wondering whether the students are continuing to attend Teacher Fan’s class. Could the principal still continue to support Teacher Fan for what he did? Hello, Mr. Principal, the first question that I want to ask you is have you ever remonstrated Teacher Fan since the earthquake? Qing Guangya: He wrote and published something on his own. It is hard to say whether it was right or wrong. As a principal, I don’t agree with what he said. But I think that we can criticize, educate or debate what he said. We cannot simply talk about punishment. I don’t think that I have the authority to punish him. Hu Yifu: When you hire a teacher, what standards do you use? Qing Guangya: The teacher should love the students and his job. That is definitely the first requirement. If he does not love his job, why should I want him? Hu Yifu: Does Teacher Fan satisfy this first requirement? Qing Guangya: Definitely. He loves his students a lot and he loves his job a lot. He is quite involved in his classes, he prepares fully and his students like him a lot. Hu Yifu: After the furor over what Teacher Fan wrote, have any parents made demands or protests to you? Qing Guangya: None of his students has done so. Instead the students suggested that I should counsel and forgive him. They continue to call him Elder Fan. The students sent me SMS to ask me not to dismiss him and stand up against the pressure. I told them, "I don't have the power to dismiss him. You don't have to worry." Guo Songmin: When the teacher abandons them, how could the students still love me? I cannot believe this. Why do you have to turn black into white? As a school principal, why are you sticking up for him? Qing Guangya: I think that his mind blanked out at the time. He was only thinking and commenting after the fact. That is true. Qing Guanya: As I said before, this was how it happened. Why would I agree with him? I know what is right and what is wrong. I was hoping that he would apologize. I was hoping that he would say he misspoke. Hu Yifu: Did the principal really said that he wants you to apologize? Fan Meizhong: I had reacted instinctively. If I had to do this all over again and this whole thing were to recur, then I wanted to say sorry to the students irrespective of whether professional ethics require the teacher to give up their lives to save children. Someone told me that it was the best choice for me to run. But no matter what, the first thing is that I could have made the students react even more slowly. At the time, I did not think I had been a coward. But at a time when the students were expecting me to show that I was a strong person on whom they could rely on, I failed to do so. This is the second thing that I should apologize about. The third thing came up after I went home and talked to my wife. She said: "Regardless of the requirements of professional ethics, your immediate reaction did not include the students. You should al least apologize to the students that you don't love them enough." Afterwards, I told the students that I agree with this view. Therefore I want to apologize solemnly to my students. Although my blog post indicated that I had no regrets, the matter has brought a great deal of pressure on the School principal Qing Guangya. I need to apologize to him as well. No matter whether the viewpoints are right or wrong and no matter whether I should have run or not in this case, the words in my blog post have hurt the feelings of some people. I apologize for that. But that doesn't mean that I am apologizing for the writing and the viewpoints. Hu Yifu: Mr. Principal, the school will still want to have this type of teacher now, right or not? Qing Guangya: I certainly did not make any decision not to want him. Hu Yifu: If someone were to ask just what kind of teacher Fan Zhongmei is, how would you describe him to the students and their parents? Qing Guangya: I would say that this was normal behavior. There was nothing abnormal about it. But he was very wrong in speaking out. We hope that we can work together to criticize, assist and educate him. But I have never considered him to be unqualified to be a teacher. Hu Yifu: How do you look at the instinctive acts of Teacher Fan during the disastrous moments? Lin Ge: I think that Teacher Fan is a honest person and he was very brave. I don't think that people should abuse him solely on the basis of character and simple morality. After the incident, the whole society lambasted him, because our society is still in a stage of immaturity. I call this the youthful stage. But I do not support what Teacher Fan said. Hu Yifu: What is the difference? Lin Ge: There are two reasons. First, I think that he does not understand the basic values of education. Secondly, his excessive rationality and sangfroid could be causing to lose the basic values that we demand for education. Hu Yifu: Therefore, you think that he may be suitable to become a very detached and objective commentator, but he should not be a teacher? Lin Ge: Yes. I think that there are levels of instincts. The basic instinct are present even in animals which would protect their offspring, right? But humans are high-level animals. People have beliefs, professional training and personal feelings. I think that it is a high-level instinct for teachers to protect their students. It is a conscious choice to do so. Lu Rui: I have spent ten days in Dujiangyan providing psychological counseling. I want to remind everybody that Mr. Fan is a person who had experienced a magnitude 8 earthquake. He is a victim in the disaster zone. He has the right to receive the kind of care and concern that are given to victims in the disaster zone, even if he has done something that society cannot tolerate. Can our society tolerate dissent? Can we allow the basic right to dissent? I think this is the bottom line in our society. When I got to the disaster zone, I was hurt just by listening to people talk. I realized that I cannot be a hero. Without going through this earthquake personally, all sideline observers are unqualified to discuss the matter of whether he should have protected the students or not. Hu Yifu: When we are faced with a clash between professional ethics and personal morality, where is the point of balance? Should we reveal our true psychological state of mind to let everybody know? Zhou Xiaozheng: Society is moving back when it demands him to be dismissed on account of his speech. My viewpoints on this matter are as follows: First, we should have a tolerant attitude towards Mr. Fan Meizhong. I am criticizing Teacher Fan Meizhong. I am severely criticizing Runner Fan. This is not the same thing. When the earthquake happened suddenly without any rehearsal, it was not terrible to behave cowardly. Many people other than himself have not experienced this. Therefore, we should be tolerant towards Mr. Fan Meizhong. Why am I criticizing Teacher Fan Meizhong? The teachers have the <People's Republic Of China Teachers' Laws> and we have the <Protection of Minors Law>. In Fan Meizhong's blog, he said something that is not quite right: "Besides you (students) are adults who are 17 or 18 years old." Please note that 17-year-olds are minors and 18-year-olds are adults. I have to ask whether his students are adults or minors. Please do not be fuzzy about this. If they are minors, then adults (and teachers in particular) need to protect them under the state law. There is no question about that. Secondly, the professional ethics and character of teachers in <Teachers' Laws> are known to everyone. If you are the captain of a sinking ship, you should be the last one to leave. This has been the case in China and elsewhere as long as it can be remembered. This is known as professional ethics. Third, why am I criticizing "Runner Fan"? Because of what he said, he is now a public figure with a high TV ratings, right? I must severely criticize this sort of thing. Hu Yifu: Our six guests have shown aspects of the most precious parts of human character. From Lu Rui, we learned the aspect of gentleness and caring. From Teacher Zhou, we saw the aspect of mellowness and fullness. Then we met the clearly antagonistic Teacher Guo. If Teacher Guo can defend morality so strongly, do we need to worry that morality will become corrupted in our society? Lin Ge told us that we are concerned about the next generation from the bottom of our hearts. From Mr. Wu, he told us that we must speak out for our friends in order to defend morality and truth. On the Internet, people may have said that Fan Zhongmei is unforgivable. But when we heard the tolerant attitude of his principal and his willingness to let Fan retain the title of Teacher Fan in society, we see that our society has made progress.